As I hang up my short white coat after my last clinical rotation of medical school, after the celebrations of commencement week subside (I have had more than my fair share of these), and before the reality and terror of starting as an intern starts to set in, I find myself looking back and looking ahead. What a wild ride these past years in medical school have been! Spending all these years preparing for the first day of internship. Along the way, also learning on the job of raising a child. As I enjoy the lull of these last few carefree days between completing medical school and starting internship, every now and then I feel like I should brush up on my clinical knowledge to allay intern year anxieties. Then I remind myself that no amount of preparation could have really "prepared" me for being a parent or a medical student, and nothing will really make me feel "ready" for intern year. Best to savor this time with family and friends. Recently I came across this article in the New York Times titled "The Gender Pay Gap Is Largely Because of Motherhood". It goes on to discuss not only the impact of motherhood on income, but also career decisions made by mothers to give up job opportunities, inequitable distribution of household and parenting responsibilities. Looking back at that experience of mixing parenting and medical school, I have reflected on how things would have been different if I didn't have my baby during medical school? How would things have been if I had gone through this experience without being a parent? I may have done better in some rotations, or gotten better grades on some tests. In the end, those things didn't matter as much as I thought they did. I ended up matching to what and where I wanted to end up for residency. Even if I had a perfect application for residency, my desired outcome wouldn't have changed. I am pretty early in my career to measure the impact of motherhood on my career and quantify it in terms of lost opportunity or income. In some ways, I can't imagine the alternate reality of going through the medical school experience without my son, my experience as a medical student is so completely intertwined with being a new parent. Sleepless nights dealing with baby eating into precious few hours to sleep during clinical rotations. Being in a perpetual rush to pickup or drop off my toddler from or to daycare. Dealing with meltdowns in the morning struggling not to be late. Preparing for tests while distracting my toddler without distracting myself from studying. However dealing with the responsibility of raising a little human taught me patience, empathy and humility, which I like to believe, made me a better human being and will make me a better doctor. How Many Balls Can I Juggle? I've been trying to dig deep and reflect on my own work-life balance... I feel like I'm living in a world in which my mantra to my learners and advisees is "Do as I say, not as I do." I love to teach. I'm in an academic position because I thrive on teaching while working clinically. I teach medical students, residents, fellows and am engaged in faculty development. I'm encouraged by my mentors to "be academically productive" however I'm not entirely clear what that means. Write, publish, be educationally innovative, do research, stay sane and be a good mom and a good doctor. I need a new organizational scheme. My most successful portion of my organization is my google calendar. I literally cannot do anything without it. I've got it color coded and labeled. My week in view is dizzying with color coordination and notes. My to do lists, however, are scattered between different notebooks, notes on my phone, loose pieces of paper that find their way into the ether. I need a new work flow solution. I need to find a way to keep track of things and move my academic work forward in meaningful ways. I sat down in a coffee shop the other day to try to make sense of it all and stratify things into columns and was overcome by this subtle feeling of butterflies and anxiety in the pit of my stomach. I've never really been ridden with anxiety, however this discomfort is rearing its head more and more frequently... feeling like I'm missing something, am forgetting something, am going to drop a ball, be found out as a fraud who cannot "do it all." While I'm not junior in life, being a "non-traditional" physician, prior career as a nurse, I am early in my career as an academic physician. As such, I feel this pressure to continue to do things which further my personal and professional development. At the same time, I want to be sure that I am giving my son the time and dedication he needs from his mom. As an ER doc, my schedule is widely variable, shifts in the day, evening, night, weekends, holidays. Sharing my son with his father affords me the opportunity to work academically without interruption about half of the time. There's still work which needs to be done when I have him. So, I try to balance it by not working while he's awake. Sometimes I'll have a random Tuesday free and we do arts and crafts, read, go to the park, ride bikes, run around playgrounds, run errands. These are the precious moments I hope he will remember and treasure... I know I do. We make meals together, he shares his days spent with my nanny and daycare and at night, I tuck him into bed, sometimes dozing with him. He looks at me beforehand, puts his little hand on my face and says "Mommy, I love you bigger than the Earth." After drifting off with him for a bit, I get up and set my sights on my late evening tasks... emails, curriculum development, evaluations, mentoring grand rounds presentations via chat mediums or Google Hangouts or FaceTime. I sit here sipping my chai tea, reviewing important dates for the next academic year, the next evolution of my growth and development as an educator, curricula which need updating and modification to be in line with current educational methodology, exploring alternative ways in which to teach and engage learners in an overall curriculum which has less and less "time" for what I feel needs to be included. I feel fortunate to have been given some incredible opportunities to take on leadership positions and influence our future doctors. How many of these am I capable of managing? Am I giving each of these precious opportunities the time and dedication required? Am I being the best educator and physician that I can be? Am I being the best mom I can be? Am I seeking out mentorship appropriately to optimize my productivity? Am I interfacing with the right people? Am I serving my learners to the best of my ability? 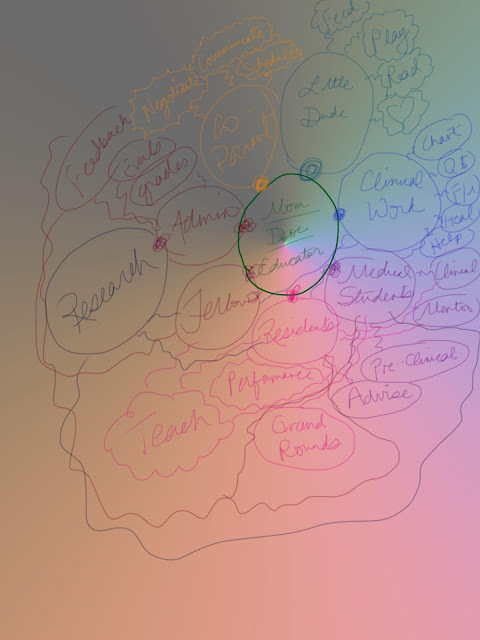 My life is a concept map. Children are expensive. So is medical school. Children take up a lot of time. So does medical school. Unfortunately time and money are two things in considerable shortage during medical training. Mixing children and medical school can be an unhappy combination. We had our baby halfway through medical school (me) and residency (the Mister). There has been lots of discussion regarding the timing of procreation in medicine (eg here and here and on this blog). 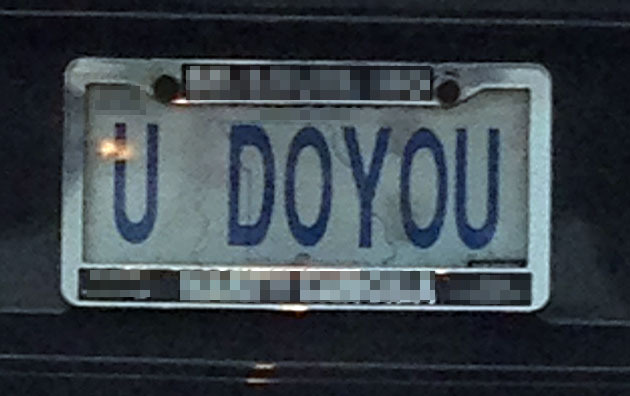 My general takeaway can best be summarized with this license plate. I have found some serious life wisdom on vehicle license plates. My general takeaway 1.1 regarding the subject of timing babies in medical training is that there is no perfect time. Each time is good in some respect and not so great in others. Having spent my 20s in pursuits of other advanced degrees, I didn't want to wait until I had a "real doctor job". But that meant that financially it was not such a great decision. Residents stipend is not enough for supporting a family, especially when one member of said family is incurring expenses of medical school. More than a third of our income goes to childcare expenses, and that's not even including food, diapers, and a multitude of other child related expenses. We are always worried if we'll be able to pay all our bills at the end of each month. I am in debt up to my eyeballs. Financial worries are always lurking in the background of my thoughts, and money has been on my mind even more as I am looking into taking out more loans for upcoming residency interviews. A friend offered me wisdom from her interview experiences, telling me about some common interview questions, one of them being "Tell me about a difficult experience you had in medical school". I said (almost half jokingly), urrmm pretty much the entirety of medical school since having a baby has been one incredibly difficult experience. It is difficult to separate the experience of being a parent from that of being a medical student, and money has been one of the connecting threads between the two. Daycare was the only affordable childcare option for us, and we are lucky to have hospital subsidized daycare. It was amusing (not really) when one of my classmates thought that "hospital subsidized" meant that all costs were covered by the hospital and it was free of charge. No, it just means there is a small discount. Though it is a "hospital affiliated daycare", but like most other daycares, it is not a 24/7 facility. Having both spouses in medical training means that both of us have very little control over our schedules. There are plenty of times that we are both working outside of daycare hours. And trainees may have an 80 hour a week work limit, but a child requires care 168 hours a week. This same classmate who thought that daycare was free, was also surprised to learn that I hired baby sitters to study for medical school exams. "Wait, so every time you have to study, you have to pay someone to watch your kid? Can't you just put him in a playpen and do your studying?" Before I had a baby, I envisioned this picture of getting home from the hospital and spending daily finite hours of "quality time" with the little one and then he would, I don't know, put himself to bed or maybe I'd read him a little bedtime story at the end of which he'd dutifully doze off and sleep through the night, and I'd get more hours of "quality time" studying. Or just like my classmate I assumed that I would be studying while the baby/toddler would be happily playing by himself on the side with his toys, of course, without interrupting me. Those fantasies/assumptions disappeared pretty fast when a real baby (who is now a toddler) showed up. Talking to other people in our situation (two medical trainees with no family close by) most options I heard of were not financially viable alternatives for us. I have heard people say to not worry about money and keep taking out loans because when I have a "real doctor job", I'll be able to pay it all off. Maybe there is truth to that. 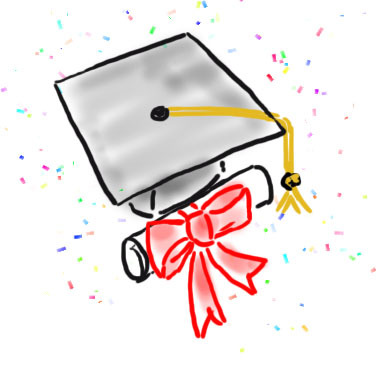 But when I look at the enormous amount of debt that I have already accumulated, and when I think about the uncertainty with future physician compensations, I don't feel comfortable taking out loans to whatever amount. Things haven't always worked out great with this whole arrangement. I have less than perfect grades in medical school. I feel like if it was just the hours in the hospital and then I could come home and eat, pray, love or something, it would be fine. But because work just gets started after getting back home from work, is what makes it so hard. After a particularly rough rotation that had lots of nights and weekend shifts (read: "when daycare is not open" shifts) and an end of rotation exam, I bombed the exam. The course master told me that he was really surprised about my exam performance because the clinical portion of my grade was stellar and there was such a discrepancy between the clinical grade and the exam grade. I didn't know how to explain that for me studying for exams cost money. Whatever little savings we had, had recently disappeared after a family emergency, and as interview expenses had drawn closer, I had scrimped on getting sitters to study for tests. As a minority it is sometimes difficult to explain or convince people even in the face of overwhelming evidence that social factors control how you experience your life and the color of your skin can change the opportunities and travails you encounter. At some point it is tiring to keep going through the explanations over and over and knowing that unless someone has actually been there, they really won't know what you are talking about. I feel that way about the experience of being a mother in medicine too. I could go blue in the face with my explanations but it is exhausting. Genmedmom here. This was going to be a sweet little post about a teaching experience from my clinic yesterday. A patient presented with a classic clinical finding, and I knew that one of the other providers had a few students with them. So I asked the patient if I could bring in a student or two, and she cheerfully assented. It's been a very long time since I was involved in clinical instruction, and I enjoyed it. I searched the web for a photo image or clip art to accompany this piece, something that illustrated a female doctor teaching medicine to students. I typed in all sorts of search phrases, but the vast majority of clipart or stock photos clearly depicting a doctor instructing medical students showed male doctors- and often with a lovely nurse standing by. 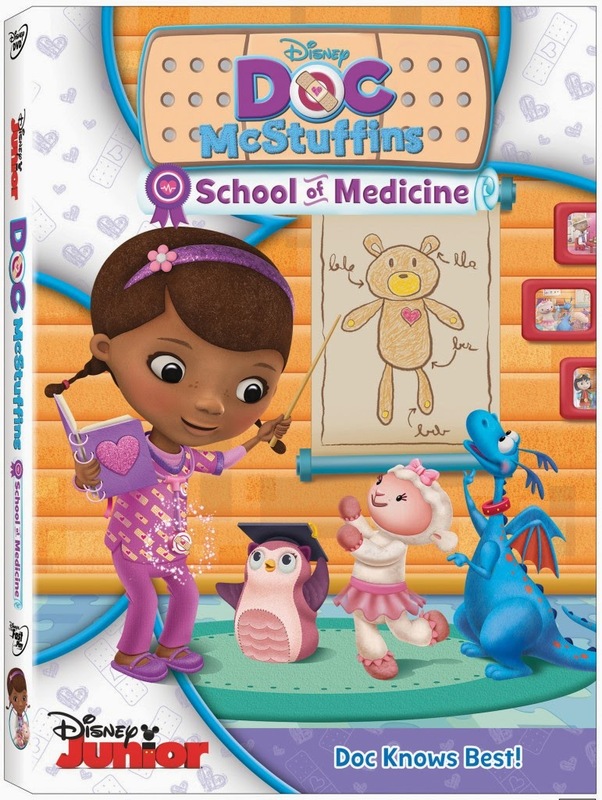 I mean, it's a good thing that Doc McStuffins exists, and that this image and the DVD it advertises exist. Not to imply a commercial plug; I must emphasize, I have no financial disclosures here! I just love the example she sets for little girls, all the pink and purple notwithstanding. She's a doctor, and her mom is too. They're African-american. The show is a hit. It's awesome. So, why was this the only image I can find of a female doctor actively teaching medicine to students? This was mind-boggling to me. I needed to understand. I needed data to interpret; it's just my research fellowship training. Of the 155,089 total U.S. medical faculty, 62% are male and 31% are female. Of those that are at the higher ranks, as in professor or associate professor, 72% are male and 28% are female. The breakdown by race/ ethnicity is frankly depressing, and I didn't even want to figure it out. For those of you that enjoy crunching numbers, have at it- there's tons of other good data in there as well. It's clear that we need more women physician role models and teachers of medicine. So, what are the obstacles? Well, in my case.... When I started by current position at a major academic medical center, I was involved in a medical school course geared towards fostering empathy and communication skills. I think every med school has these now, Patient/Doctor/Society type courses. But then I became pregnant with Babyboy, and realized I would be out on maternity leave for a chunk of the next session, so I never signed back up. Now, with two very young kids and enough to balance as it is, I'm not sure I want to take on the added responsibility of teaching...Not just right now. I know my kids will get older, and I hope to get involved with teaching again someday. Likewise with medical volunteer work. I'm half Latina, I speak Spanish, and I've lived and worked in Latin America. At some point, I'd like to get re-involved in that work, as well as be a mentor for Latina students...Someday. Meantime, I very much enjoyed interacting with our students over a case of erythema multiforme this week. I'm curious what the doctor-moms out there think of these numbers. Do we need more female physicians teaching medicine? How about female minority physicians teaching medicine? And what do others think about Doc McStuffins?